This website is an ongoing project to collect and display information and images of historic Annandale Village. Feb 19 Added postcard of house at West St. and Beaver Ave. to the Streets Gallery. Thanks Marianne for the scan! Apr 5 Added 1910 view of Main Street to the Streets Gallery. Apr 2 Added 1851 Cornell Map to the Map Gallery. Jan 1 Added new gallery for Mountainview Youth Correctional Facility Gallery. Oct 19 Added Pickell House image to the Streets Gallery. Oct 19 Added map from 1940 to the Maps Gallery. June 15 Added McCloughan Mansion Prospectus from Michael Margulies of Eclectic Architecture to the McCloughan Mansion Gallery. May 18 Added images of Annandale Dairy Farms pamphlet to the Creamery Gallery. Thanks to Robert. May 10 Added image of Annandale Baseball team from 1907 to the Miscellaneous Gallery. Mar 30 Added gallery for the Headley House. Documentation from Michael Margulies of Eclectic Architecture. Mar 30 Added Runkle Cemetery images from photographer Donna Herrmann in the Runkle Gallery. Mar 30 Added link to McCloughan mansion images from photographer Donna Herrmann in the new McCloughan Gallery. Mar 30 Added image of Annandale Reformed Church in the Church Gallery. Aug 18 Added image of Annandale Train Station from 1968 to the Rail Gallery. 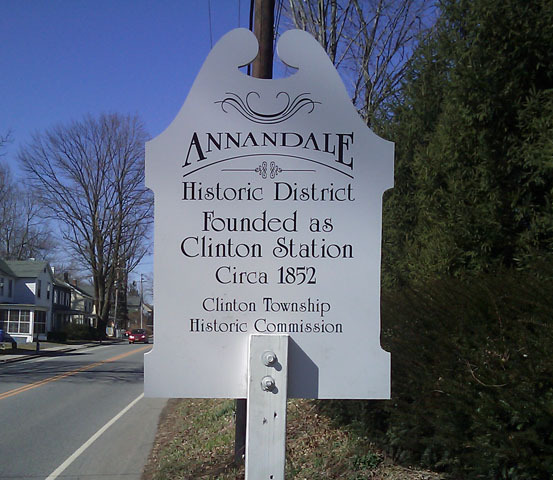 Aug 18 Added Annandale 150th Anniversary Tour to the History section. Apr 15 Added image of Annandale Station c. 1976 to the Rail Gallery. Apr 13 Added image of Annandale Station c. 1982 to the Rail Gallery. Nice Kiss Graffiti! Dec 16 Added image of Annandale School c. 1910 to the School Gallery. Thanks to the Coss Family. Sep 6 Added image of Train Station from 1967 to the Rail Gallery. Aug 5 Added image of an Annandale Dairy Box to the Creamery Gallery. May 28 Added image of the Annandale Peach Exchange to the Rail Gallery. Apr 24 Greetings from Annandale, New Jersey Postcards for sale for one dollar. Apr 6 Added image of the original Clinton Station train station to the Rail Photo Gallery. Thanks to the Collection of the Red Mill Museum Village. 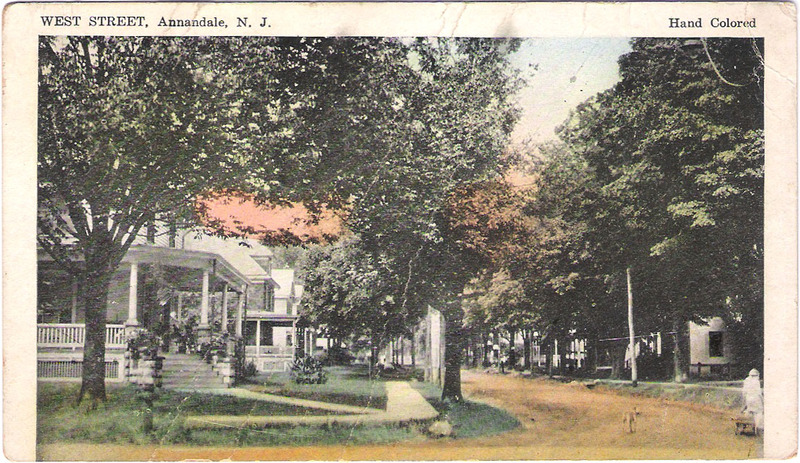 Mar 5 Greetings from Annandale, New Jersey Postcard. Jan 1 Added link for images and information I am seeking. Jun 17 Added image of S.A. Seals "Lehigh" Stoves for sale sign in the Stores gallery. Jun 11 Added images of S.A. Seals match safe in the Stores gallery. Apr 24 Added image of Model T Fire Truck at Annandale Hose Co.
Feb 6 Added Lumber Yard gallery with B.W. Farrington 1938 Mack Truck. Feb 4 Added postcard with portrait of S.A. Seals in the Stores gallery. Jan 30 Added image from 1960s of Annandale Train Station. Dec 31 Happy New Year! Added image from August 1983 of Annandale Train Station. Dec 10 Added neighboring towns images. Dec 1 Added more images to streets, rail and misc. Thanks to Peter for the scans! Nov 2 Added images of Beaver Brook Homestead auction brochure. Aug 13 Added 1930's image of Main St. showing General Store, Annandale Hotel and Passenger Depot. Mar 21 Added Annandale sign (above) and images of Jones Tavern and Jones Tavern sign. Added images of Beaver Brook During Roy Barton White's years there from 1933-1941.